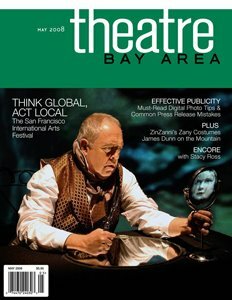 Theatre Bay Area Magazine is featuring Mordake on the cover as part of an article about the SF International Arts Festival. The article quotes me quite a lot, even going so far as to extemporize a bit beyond what I may have actually said. But what the hey. Great picture of Duykers on the cover. Hey, I just read that article. They "quote" you quite A LOT. The festival is coming up...so have a splendid gig, Erling!